Do you like to eat your food seared and grilled? If so then you must read our Hamilton Beach 25360 Indoor Flavor Searing Grill review. It is one of the best that we found in the market. For healthy and quick meal following a day’s work, you may not get a better option than this. Through our review, you may able to find out if this indoor electric grill is the one for your kind of cooking. In A Hurry? 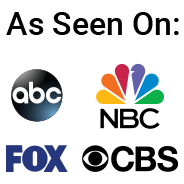 Click Here To See The Price <<===. The effective surface of the Hamilton beach flavor grill is 12 x 9 inches and that adds up to room enough for four burgers, 3 T-bones just to give you an idea on how much you can cook on it at the same time. This is just a personal choice and does not affect the grilling capacity or outcome of your cooking. The Hamilton beach searing grill with lid viewing window gives you to watch what your are cooking without opening the lid. This will probably prevent heat loss that you will always have by opening the lid of any grill. You have to decide if it is worth the extra money in your situation. Window model is a little higher priced. 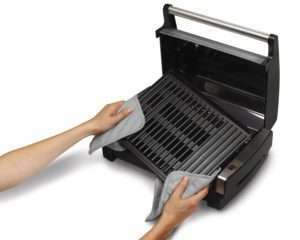 The grate is made of steel and covered with a non-stick coating to prevent your food from sticking. Could not find any problems with the grill plates. They are dishwasher safe and very easy to remove. Finding positive news about the Hamilton grill was pretty easy, Here are the ones we found most. I was not able to find to many cons of this Hamilton beach indoor electric grill. The occasional lemon that did not get hot or hot enough was about all I could find. Construction looks a little flimsy. We can recommend this grill as a pretty good buy and this is based on an opinion we formed after reading a lot of the almost 600 reviews we found online in a short period of time. Remember that this is a grill and not a sandwich or panini maker. Only the bottom plate is heated by the 1200 Watts heating element and the lid is just a lid and has no heating element. This does not mean you can not use it for sandwiches. You just have to flip them like on a flat grill of skillet your would use. Although available in the version with or without the window we could not find any recommendation for the lid except that you can watch your meat cooking without opening the lid. The only advantage is that the Hamilton beach searing grill with viewing window will have less heat loss because that is what happens when you open the lid of-course. This will make the grill have to cycle in and out less will give a more even heat in the cooking process. This grill is great to be used with skewers and make some great kebabs that way. We recommend always to use metal skewers since they can be use over and over again and it is a personal experience that the bamboo skewers always burn. But maybe they work on this electric grill since there is no open flame. Use 8″ skewers to stay within the grill surface. The temperature setting on the dial are in steps of 50 degrees ranging from 200 to 400 degrees. I read someone testing it and it heated up to even 450 degrees in his case. More or less smoke is decided by the amount of fat in the meat you are grilling, just like on any outdoor grill. This is not a smokeless grill since they do not exist in my personal opinion. In the reviews we read most people mention that they see hardly any smoke unless they used real fat meat. The reason I can come up with is that the grease runs of the non stick plates pretty fast and does not have enough contact time with the grill to start smoking. The large drip or grease pan like people call it got some nice remarks as being big enough. This has in many other grill reviews a con point. There are experienced users that line it with aluminum foil and they claim that they do not have to clean it or just at a minimum. The taste of the meat is a question that is asked many times. Many wonder if the taste is the same as on a charcoal grill and there are as many opinions as websites about the subject. The overall opinion in the customer ratings I found is that the meat taste great and many do not taste any difference with meat grilled on an outdoor gas or charcoal grill. If you like a larger grill area and a heating element in the lid also I recommend that you have a look at the Cuisinart GR-4N that also got some great ratings from many users. For any serious grill use we highly recommend the use of a digital thermometer. The best choice is to start with a pocket thermometer and maybe later use a digital probe thermometer so you do not have to open your indoor or even outdoor grill anymore. Both are also very good to use in the oven. Never have over or under cooked meat anymore. Skewers are great to use on this grill and with the size of a the grill surface the best size to use and keep the handles cool are these metal skewers we found. You can find a selection of skewers here! 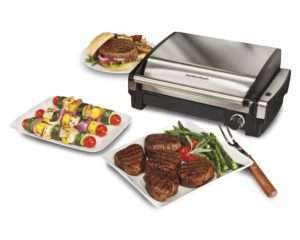 For Hamilton Beach indoor grill reviews you can click on the link in the menu and see all of them.